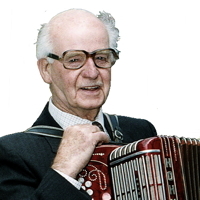 Information: James "Jimmy" Shand (1908-2000), accordionist and Scottish band leader. Some of us older dancers remember the days of vinyl records and dancing to Jimmy Shand's Strict Tempo Scottish Band. I copied this from the strathspey newsgroup. Shand, James, MBE, accordionist and Scottish country band leader, for services to Scottish culture. A separate report reads: Accordion laird becomes a knight, by Jason Allardyce. A shy maestro of the button board accordion admired by the Queen was awarded a knighthood for his contribution to Scottish music over seven decades. Ninety year old Jimmy Shand known in Scotland as the Laird O'Muchty, was honoured after a campaign by the Association of Accordion and Fiddle Clubs. Mr. Shand, who has had a number-one hit  Bluebell Polka  during his 65 year career, has had difficulty playing for the last three years. But in July he managed a performance for the Queen and the Duke of Edinburgh at Letham village hall, Fife where he lives. It was the seventh time that the Queen had requested a meeting with the musician. Mr Shand who has sold millions of records around the world, said at his home that the award was the icing on the cake for his career. Earlier this year he became the first Freeman of the Kingdom of Fife. P.S. : I will leave it to the heraldic experts to explain how a Mairrit man becomes a Knight Bachelor  I'm confused :).